There were three contested races for school board seats in Sussex County on Tuesday. 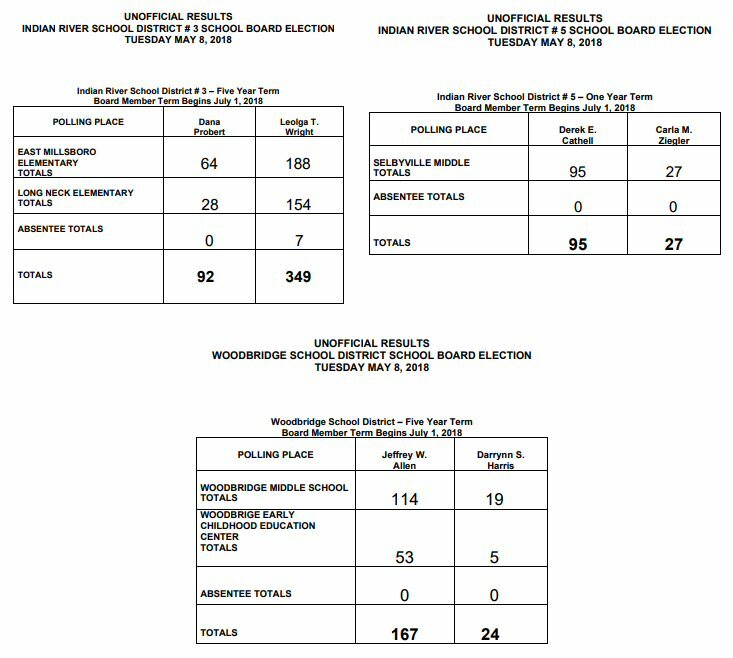 In the Indian River School District both incumbents were re-elected. Leolga Wright will continue to represent District 3 – she took 349 votes to Dana Probert’s 92 votes. Derek Cathell returns to District 5 after grabbing 95 votes. Challenger Carla Ziegler received 27. In the Woodbridge District, Jeffrey Allen got 167 votes – Darrynn Harris got 24. Allen will take over the at-large seat being vacated by Walter Rudy, who did not run for re-election. All the winners will serve 5 year terms beginning on July 1st.